Drops of water that fall out of clouds in the sky. I do not like going outside in the rain. 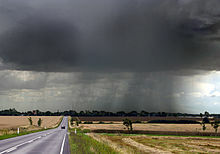 If it is raining, water is falling from the sky. This page was last edited on 24 April 2017, at 03:35.